MODs, extensions and styles are what immediately come to mind when thinking of the phpBB.com customisation database, but there are other types of customisations too. This part of phpBB Numerology takes a look at every type of customisation. There are some obvious anomalies in the data (like the Viewtopic Birthday MOD) which haven’t been removed from this raw analysis. With that said, this data still gives a fairly accurate representation of how people use the customisation database. MODs, due to their prevalence in the phpBB2 and phpBB 3.0 era, are still the undisputed king of the customisation database and will take some catching up. Styles may catch up in the medium term though, as it’s a forever expanding customisation type in phpBB 3.1. It’s not surprising to see phpBB tools well represented on the list. 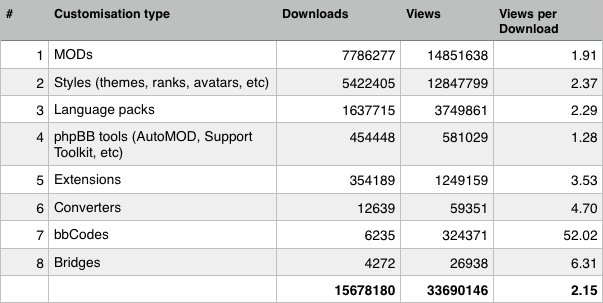 AutoMOD and UMIL alone represented 208757 and 151820 downloads respectively – very popular tools. Converters and Bridges round out the top 8, being quite niche categories. As noted earlier, the figures may be a little high due to anomalies but after taking into account off-site downloads through development topics and the like the numbers may actually be conservative. It’s therefore very pleasing for everyone involved in the phpBB community, and something to be very proud of, that phpBB customisations have exceed 15 million downloads. For the fifth and final part of phpBB Numerology we’ll go back to where it all started – extensions – and take a closer look at the categories of extensions that are most popular.